E. coli is short for Escherichia coli and is a bacterium best known for its ability to produce infection in humans and animals. E. coli bacteria are shaped like a rod, which makes them bacilli or bacilli-form bacteria. They are optional anaerobes, meaning they can grow and multiply in the absence of oxygen, but can and will use oxygen for growth if it’s present. In this respect, E. coli is special because, unlike other bacteria, it is highly adaptable. Many other types of bacteria require oxygen to grow and multiply (making them obligate aerobes), are damaged if oxygen is present (obligate anaerobes) or tolerate oxygen, but cannot use it to grow and multiply (aerotolerant anaerobes). Is E. coli Gram-negative or Gram-positive? Escherichia coli is a Gram-negative bacterium. What this means is that, when tested using the Gram staining method, E. coli stain pink. Unlike Gram-positive bacteria which have one cell membrane and a thick layer of peptidoglycan (a large molecule made up of sugar and amino acids), Gram-negative bacteria like E. coli have two cell membranes, an inner cell membrane and an outer cell membrane, with a thin layer of peptidoglycan in between. During the Gram staining method, a crystal violet dye is applied to bacteria fixed on a slide. The color is set and then a decolorizer is applied. The decolorizer dissolves the outer bacterial membrane in Gram-negative bacteria and washes away the dye from the thin layer of peptidoglycan. In the Gram-positive bacteria, the pigment is retained because of the thick peptidoglycan layer. A second, lighter, red-pink dye is then applied; this dye is absorbed, but doesn’t show in the Gram-positive bacteria because it’s already colored in purple-violet. However, the dye stains the Gram-negative bacteria pink because the previous color was washed away by the decolorizer. The Gram-staining test isn’t really about the color, but about what the color indicates: the lighter, pink-colored bacteria have two cell walls which can make them harder to target with antibiotic treatment. And E. coli being Gram-negative with two cell walls, the pathogenic forms of the bacteria (those that cause disease) have the potential to produce severe infections and complications and even resist traditional antibiotic treatment. Actually, E. coli is both motile and non-motile. The motile E. coli strains have multiple flagella (lash-like projections) that help them move independently. The non-motile strains don’t move independently. Escherichia coli size: the bacteria are about 2 micrometers long and have a diameter of approximately 0.25 micrometers, but may increase in volume up to 3 times (data from Facts about E. coli: dimensions, as discussed in bacteria: Diversity of structure of bacteria: – Britannica Online Encyclopedia. Britannica.com. Retrieved 25 June 2015). Like so many other bacteria, E. coli can be found everywhere around us: in water, soil, food and living beings. For the most part, the bacteria are adapted to living hosts (humans, mammals, birds) and prefer the gastrointestinal tract. E. coli are expelled from the gastrointestinal tract via stools all the time and this is how they end up in water, soil and our food. The bacteria can live outside a host for a limited period of time ranging from several hours to several days. Depending on the kind of effects they produce, they may be beneficial to humans or other living beings or pathogenic, producing infection and disease. Overall, there are many different strains or variations of E. coli and each one tends to prefer a certain type of host. At the same time, strains can adapt to colonize or infect other organisms similar to their host. According to their effects on human health, Escherichia coli bacteria can be classified as non-pathogenic or pathogenic. 1) The non-pathogenic strains are harmless and do not produce disease. They are actually part of the normal human gut flora (or microbiota) and some of them are even good for us. Some non-pathogenic E. coli in the intestinal tract can produce benefits such as help us synthesize vitamins, while others simply exist to eat and don’t produce any benefits or side effects. 2) Pathogenic strains of E. coli produce infection and disease primarily in the form of diarrheal disease such as bacterial gastroenteritis (stomach bug) and traveler’s diarrhea or in the form of urinary tract infections (UTIs), skin infections and even meningitis in newborns. 1) Vitamin synthesis. The bacteria help produce vitamin K2 and thus indirectly contribute to blood coagulation and anti-inflammatory benefits. 2) Contributes to good immunity. Well-established populations of good gastrointestinal bacteria prevent potentially pathogenic bacteria from attaching to the intestinal walls and producing infection. 3) Benefits for digestive health. Like other good gut bacteria, E. coli too ferment various food elements in the gastrointestinal tract for their own benefit. But these natural fermentation processes yield by-products that are also good for the gut environment and ultimately the host, enhancing digestive health. 1) Gastroenteritis (stomach bug or bacterial gastroenteritis). See article on Gastroenteritis: Causes, Symptoms and Treatment. Possible complications: severe dehydration, peritonitis, septicemia, hemolityc uremic syndrome with comes with the risk of edema, cardiovascular complications (high blood pressure), kidney damage, neurological damage. 2) Traveler’s diarrhea, Crohn’s disease, hemorrhagic colitis. 3) Urinary tract infections (UTIs). Possible complications: fertility problems from recurrent urinary tract infections. 4) Meningitis (seek medical help immediately is you suspect meningitis). 6) Skin infections, mild to severe. 1) Mild to severe abdominal cramps. 2) Loose, watery stools (diarrhea). 3) Diarrhea with blood in severe cases. 4) Fever, although not always present. 5) Loss of appetite, nausea, vomiting. Complications: hemolytic uremic syndrome, peritonitis, sepsis, inflammatory bowel disease. Also read What to Eat When You Have Diarrhea. Complications: Long-term fertility problems from recurrent UTIs (in women). Important: If you suspect you have developed an E. coli infection, whether it’s gastroenteritis or other inflammatory bowel disease, urinary tract infection, meningitis or pneumonia, it’s imperative that you see your doctor as soon as possible. Your doctor will assess your health, run tests and decide the best course of treatment for you. What you can do is make sure you stay hydrated and see your doctor. It can be said that both non-pathogenic and pathogenic E. coli bacteria are ‘contagious’, in the sense that you can pick them up from other people or food or water containing the live bacteria. For example, newborn babies pick up non-pathogenic (harmless) E. coli from virtually everyone who touches them and these strains then contribute to the baby’s own developing gastrointestinal flora. And everyone can pick up pathogenic (disease-causing) E. coli from other people, contaminated food, water, soil and develop an infection. 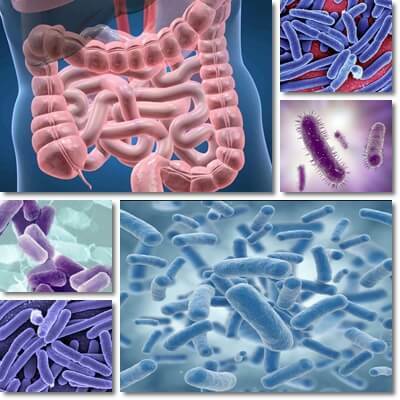 Pathogenic, disease-producing E. coli is essentially transmitter by ingestion of live bacteria. This can happen if you drink contaminated water, eat contaminated food, undercooked contaminated food or eat or handle food without washing your hands first. Because this particular type of bacteria lives in the gastrointestinal tract, you basically have to eat it so it can produce infection. Is E. coli airborne? No, it isn’t. You have to ingest it in order for it to produce infection. Viruses like the influenza virus are airborne. How does E. coli get on food? 1) Direct contact with stool matter from using bathroom facilities, changing diapers, washing underclothes by hand, followed by preparing food without washing hands first. 2) Contact with surfaces or objects contaminated with stool matter (toilets, door handles, dirty diapers etc. ), followed by preparing food without washing hands first. 3) Food contamination may occur at any point during the food distribution chain (harvesting, packaging, transportation, food preparation in restaurants etc.) and is caused by poor hygiene. 4) Irrigation of food crops with contaminated water. For example, crops may be irrigated with untreated sewage water (water from toilets) or greywater (water from showers, baths, sinks). If people are sick with an E. coli infection, it will contaminate the water and the crops it’s used to irrigate. E. coli in salad mixes, lettuce, spinach, even cucumber and other vegetables can result from this kind of agricultural practices. See article Lettuce and E. Coli: Symptoms, Treatment and Prevention. 5) One contaminated food may transmit the bacteria to other surfaces in a kitchen and to other foods. E. coli can be found in raw meat, eggs or vegetables. Using the same cutting board or kitchen utensils for all your food (example: handling raw meat and vegetables on the same board without washing it) can transmit the bacteria further. 1) Washing your hands after using the bathroom, changing diapers and after any activity that may involve contact with stool matter. 2) Washing fruits and vegetables very well. When there is an outbreak from raw food, avoid eating the suspected food raw until all potentially contaminated products are recalled. 3) Cook your fruits and vegetables well or choose pasteurized fruit juices, vegetable juices and other products. This is especially important for small children, pregnant women, the elderly and anyone with a chronic illness. 4) Cook meat thoroughly. Avoid rare steaks and all undercooked meat products, especially if pregnant. 5) Practice good hygiene in the kitchen when preparing food. Wash your hands before preparing food and before switching to different kinds of food. For example, after you handle raw meat, wash your hands and change or wash boards and utensils. Don’t use the same cutting board or kitchen utensils for raw meat and foods you eat raw like fruits or vegetables. Avoid picking up the phone, touching money or other similar objects while preparing food. Overall, think about how the bacteria are transmitted (through stool matter, via ingestion) and you will know how to better avoid them and prevent infection.